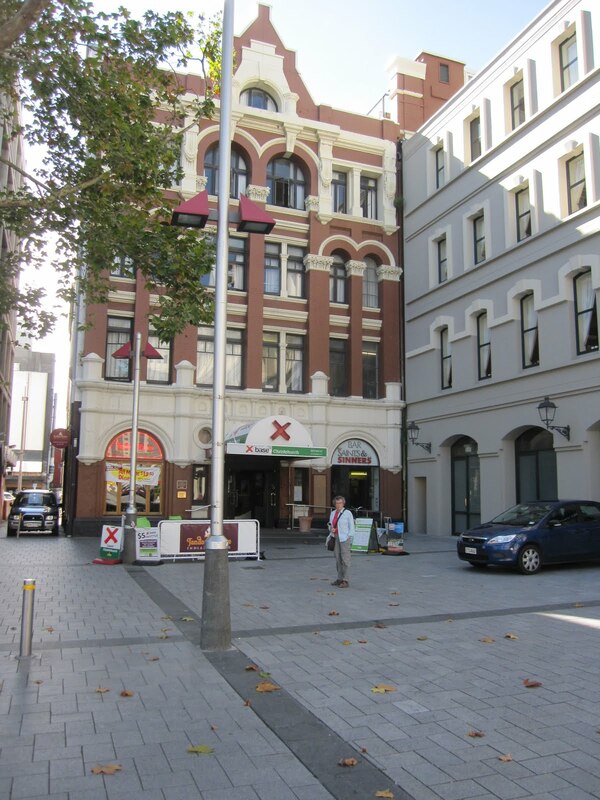 The variety of hostels, motels and hotels is an interesting part of travel. For Australia and New Zealand I had a list of hostels in various towns, downloaded onto my i-pod, so we would pick one and try to find it in town, and make a decision on the spot whether it was acceptable or not. (And I don’t think we ever decided “not” although there were a few I’d not return to). 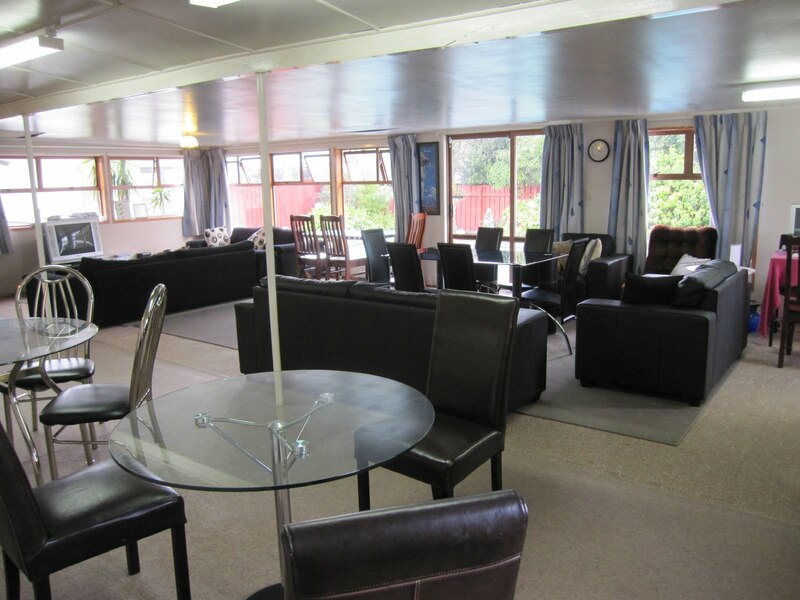 A hostel simply means accommodation where shared kitchen facilities and lounge area are available. There could be dorm rooms (with 4-10 beds) and/or double rooms. We always took a private room, sometimes with private bath and sometimes not. Although we haven’t moved up the ladder very far, we have passed the stage of taking dorm beds! Sometimes we stayed in cheap motels. Hostels cost $50-65 for two of us, and the motels were $75-100. 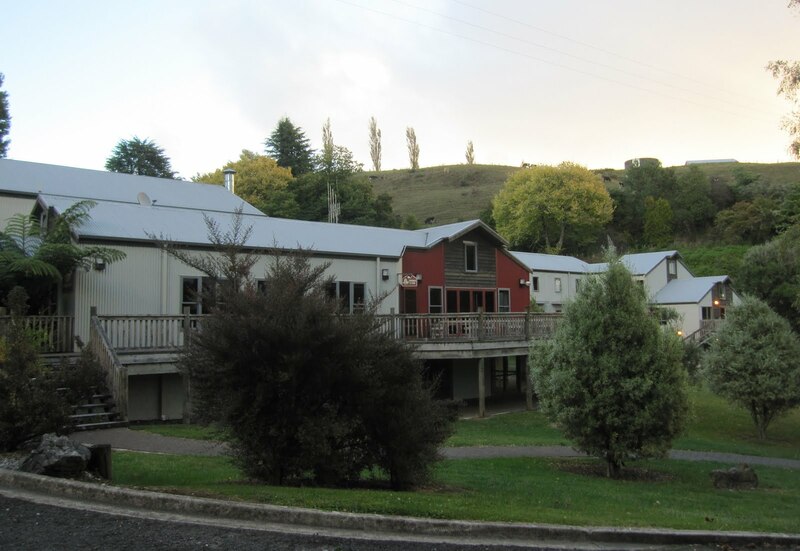 Our first hostel was in Waitomo, NZ,was a cross between a student dorm and a summer camp. Mostly young people, some in groups. Not an especially cosy atmosphere, but clean, modern and functional. You can see the camp-like appearance. 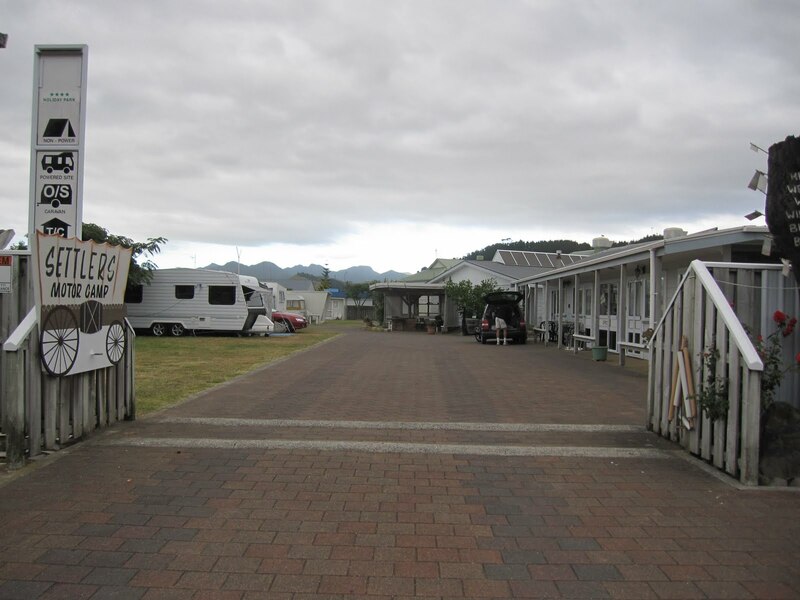 The next place was in Rotorua, where not too much was available that weekend. 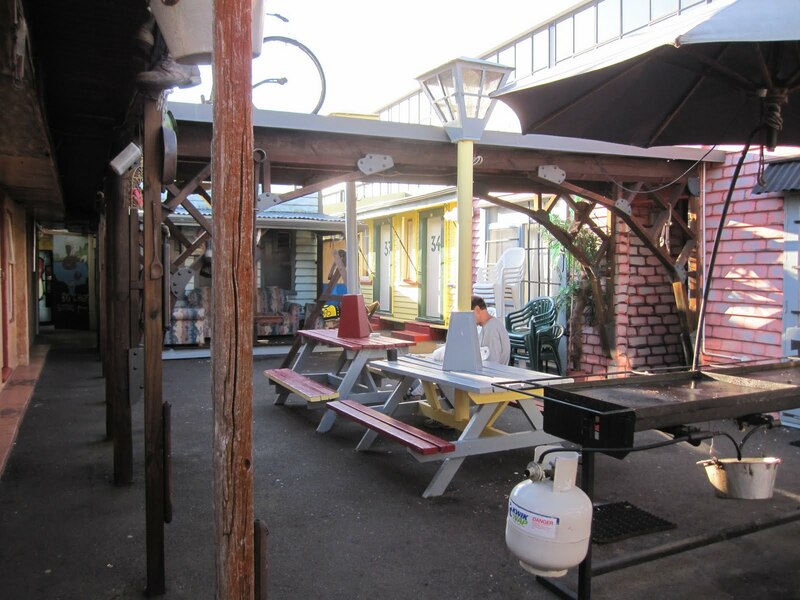 So we end up in a Tex-Mex-themed place, with various low buildings connected by open-air areas with picnic tables and a barbeque. 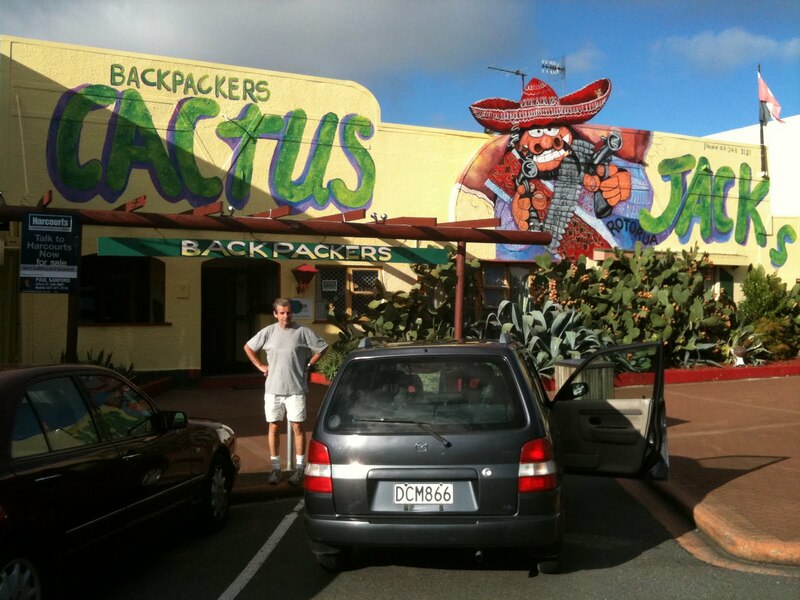 That would have been perfect, had we been in Texas or Mexico, but it seemed kind of odd since we were in New Zealand. The wild colours and theme helped cover the shabbiness, though. The bed was terrible, but since we didn’t get any bedbug bites, we stayed a second night rather than bother to move. I got to like it better the second night! Another night was in a 50s style motel. We had 2 rooms – the front was a kitchen-living room with 2 sets of bunks in the back room. 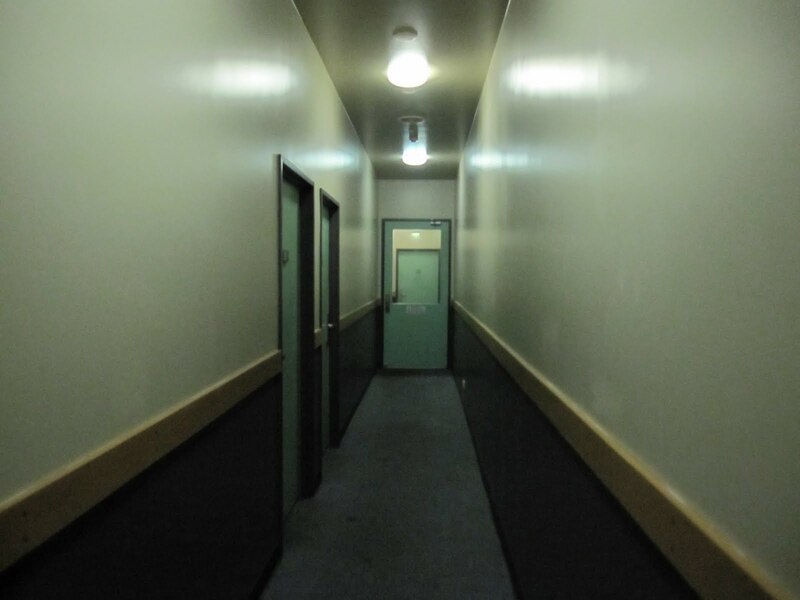 The bathrooms were communal like a campground – in a separate building nearby. Near Auckland airport we stayed in a pleasant house and the owner drove us to the airport in the morning. Nice room, huge lounge with TV, DVDs (I watched Into the Wild). 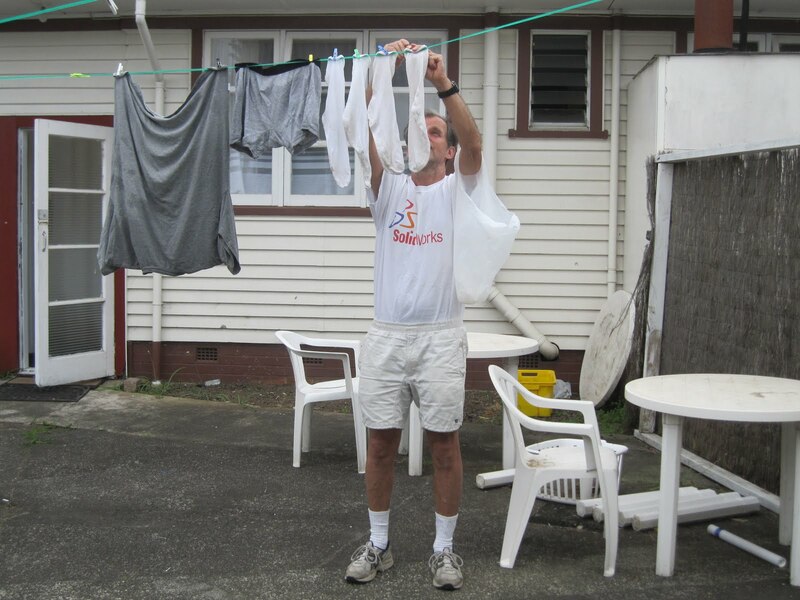 J even got to hang his laundry outside. 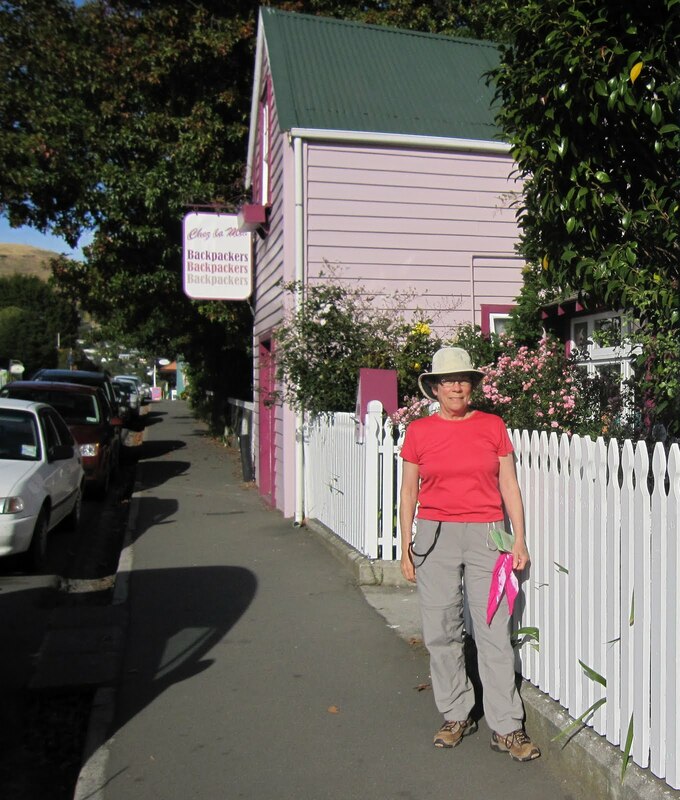 In Akaroa we stayed in a pink and mauve hostel “Chez la Mer” run by a couple who abandoned New York City to raise their kids in the slower pace of New Zealand. Another night back in Christchurch the nice Victorian place was full so we went to the big backpacker place in town. 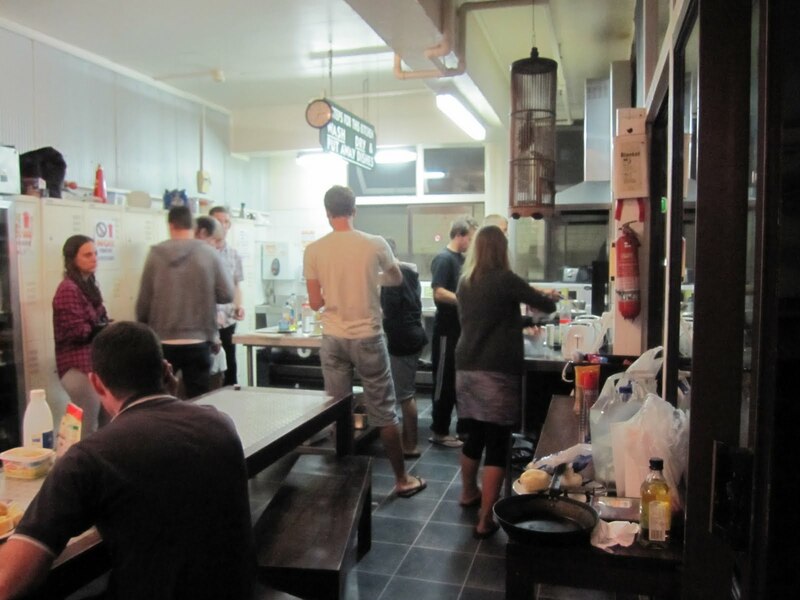 It was more institutional and the big kitchen/eating area was full of young people from everywhere. But our room was nice, at the top of the building so it was quiet. 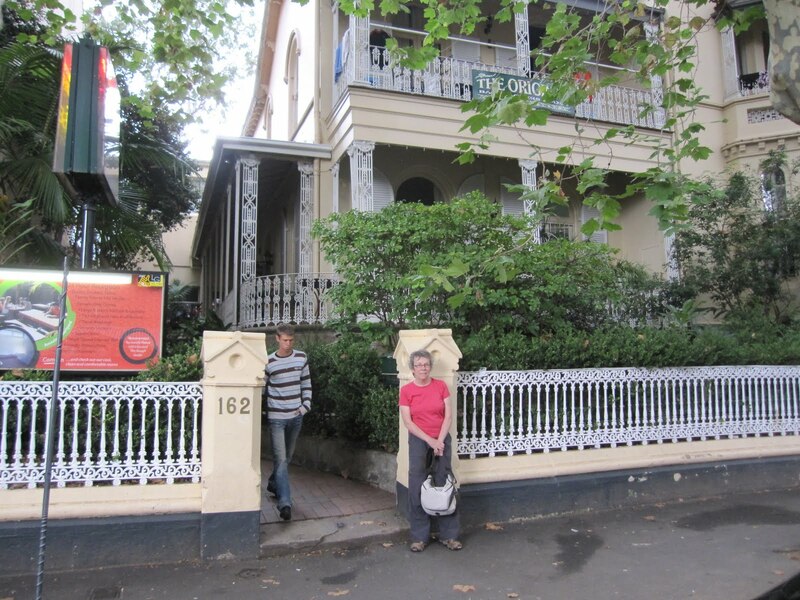 In Sydney, Australia, we stayed in 2 hostels in the cheapo Kings Cross area. The first had a lot of Germans and South Americans and excellent reviews in the guide books, but it was kind of cramped in the common areas. Someone kept letting a door slam all night. That place was full for the next night so we went around the corner to a more quaint house. Of course, most (but not all) of the guests were much younger than us. The street was full of backpackers’ places with camper-vans parked on the street with for-sale signs. 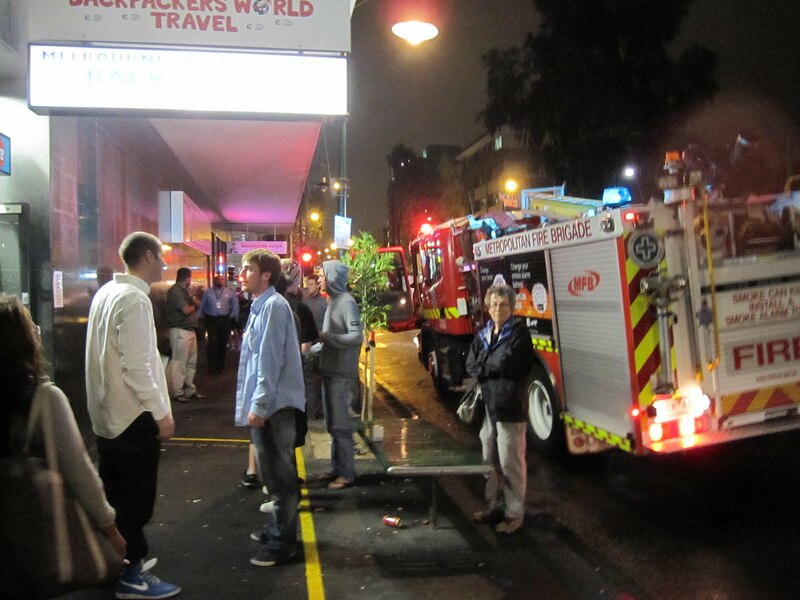 That was the area of Sydney where people go to buy a van to drive around the country. The veteran travellers who were selling hung around that area, living in their vans and socializing on the sidewalks, until they sold to a new traveller. It was like a gypsy market. In one town down the coast we could only find a room over a pub. It was quiet enough, but we couldn’t open the windows and it was very stuffy. So well into the night, J decided to go sleep in the car instead. He drove a little way, to a side road at the edge of town. In the morning the car wasn’t there, so I went across the street to a nice coffee shop. I was relieved when he showed up as I’d been wondering if he had been arrested. 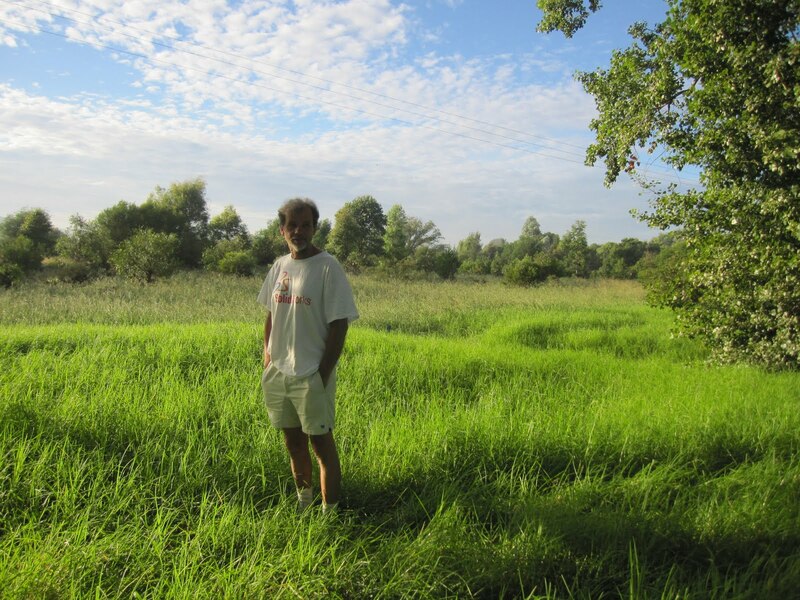 He was was very pleased with himself as he had driven to the edge of town, slept superbly, and in the morning found himself in verdant tranquil surroundings. All in all, we were very happy with the experiences. 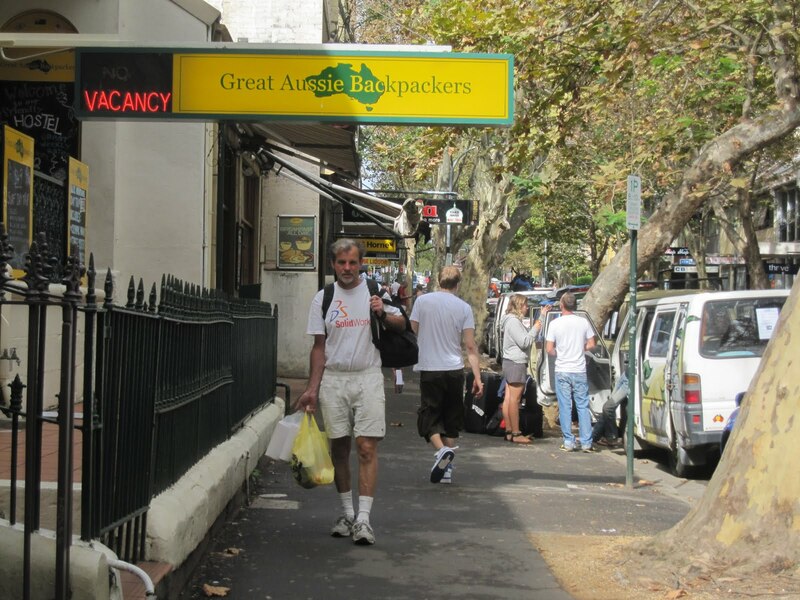 Every place was different – staff ranged from family owners to backpackers earning their own rooms. The clientele was equally diverse – families, old couples like us, young couples, singles, from North and South America, Europe, Asia, Australia and New Zealand.